Challenging and complementing the existing literature on the Italian refugee crisis, this working paper by Andrea Pettrachin develops an actor-centred approach to open the ‘black box’ of asylum governance processes, showing the constitutive effects of governance on the asylum issue. 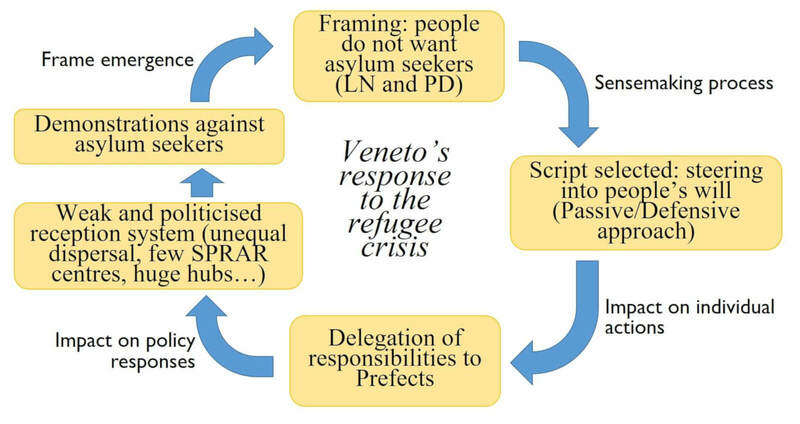 The approach developed is applied to the case of the Veneto region in Italy during the recent “refugee crisis”, a heuristic case-study that shows the value of the approach developed. The paper, first, investigates the cognitive and environmental mechanisms that shape key actors’ asylum policy decisions. Drawing concepts and ideas from framing and sensemaking theories, it shows that, while there is certainly a strategic element that shapes actors’ policy preferences, there is also a meaningful cognitive component in asylum governance. The analysis reveals, indeed, that actors’ strategies are powerfully shaped by political actors’ (different) understandings of public attitudes on migration, rather than by attitudes per se. Secondly, SNA is applied to examine how such understandings are located within and depend upon network relations and to investigate actors’ agency, power and interactions. The analysis shows that local asylum policy outcomes are deeply influenced by the “politics of policy-making”, i.e. by power dynamics and how powerful actors position themselves, behave and mobilise their understandings. Ultimately, the paper sheds light on the interplay between the “regulatory” and the “public reaction” dimensions of the Italian asylum crisis, illustrating the politicisation of asylum governance and the relationship between public attitudes on migration, frame emergence, policy-making, politics and public mobilisations in the active constitution of the Italian asylum crisis. The research from which these findings are derived was funded by the European Research Council for the project ‘Prospects for International Migration Governance’ (no. 340430) awarded to Professor Andrew Geddes.